We managed to pop down to Rough Trade East on Friday and get our copy of Street Sketchbook signed by all the artists in attendance. Shouts outs to Tristan, Showchicken, Dist, 45 RPM, Richt, Mudwig Dans, Paris, Xenz, Turbo, Guy Mckinley. Mr Jago, Nylon and all the rest. Was cool to catch up with old friends and meet up with some of the European artists featured in the book. One of the artists we meet was Zbiok, a Polish painter and Urban Activist. We have been looking through his website over the weekend and are really liking what we have been seeing. We believe he will be having a show here in London in the not to distant future. Check the freshness here. Oh so very cool! 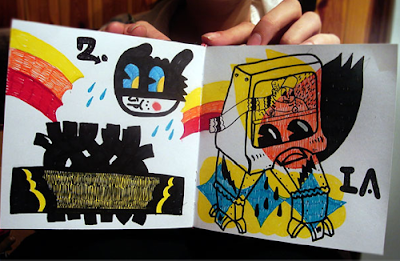 I love the pics your posted, they make me have sketchbook envy. 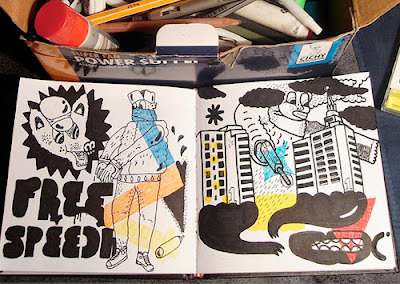 Zbiok is mad cool, described by Sickboy as a vodka hooligan, I just call him Vodzilla. Got to hook up with many creative heads at the launch but was most impressed with this guy,we got on good. By the evening I had secured a deal on three of the canvas pieces in the book. Now im looking forward to collecting more works from the kool one!